LAS VEGAS, Jan. 4, 2017 /PRNewswire/ -- Consumer Electronics Show (CES), The Venetian, Venezia Tower, Floor 33, Suite #139 -- Heath Zenith® delivers new levels of safety, security and convenience to homeowners seeking video monitoring of their homes' doors and exterior spaces. Anyone who has wondered "who's at my front door?" 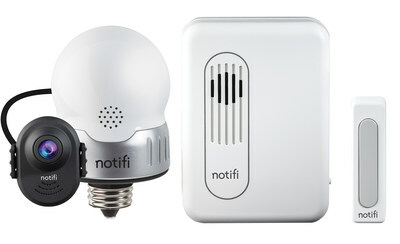 will be able to safely and securely find out using the advanced notifi™ system. notifi technology and security products for a home's exterior are demonstrated this week during the Consumer Electronics Show (CES) in Las Vegas. 1) notifi LED Bulb, Video Doorbell System – Everything a homeowner needs to add safety and security to any exterior door in the home. A retrofitted LED bulb inconspicuously combines the camera with the lighting source. The bulb's light levels are fully adjustable, up to 500 lumens. The wireless system's camera is fully adjustable and features a 115-degree wide-angle camera activated by the notifi 180-degree motion sensor. notifi's two-way communication system provides access to video at any time of day, and can deliver an instantaneous view to what's going on at any door to the home, on demand. Manufacturer's Suggested Retail Price (MSRP): $179.99. 2) notifi Video LED Decorative Lantern System – The advanced LED notifi video monitoring system with two-way communication is completely integrated within an attractive lantern. This beautiful fixture is a complete video safety system, and is capable of emitting 500 lumens. The system is activated by the notifi 180-degree motion sensor, and can be accessed from a smartphone at any time to instantly see what's happening outside of a home's door. MSRP: $199.99. 3) notifi Video LED Security Light System – A powerful LED motion-activated security flood light, complete with video camera. Easy to install and designed to be mounted anywhere around a home's exterior – backyard, patio, driveway, or most anywhere else – 2,350 lumens will brightly light up the area and provide remote access to video of the location. MSRP: $229.99. "As a market leader, Heath Zenith is uniquely capable of bringing innovation to the chimes, lighting and security space," said Kenny Ramsey, CEO. HeathCo LLC. "The utility of notifi will increase as we look to partner with leading developers of connected-home technologies and integrate notifi into their systems." The core component behind all three notifi systems is the free notifi app, providing access to all the company's video systems. Preferences for each system can be set within the app. All three systems have motion-activated notification with on-demand video any time of day. Additionally, premium service is available delivering 30 days of video cloud storage. HeathCo is the manufacturer and marketer of Heath Zenith branded products, and recipient of second-runner-up honors for the 2016 Merchandising Innovation Award from Home Depot. Through ongoing pursuit of innovation, HeathCo has compiled a large portfolio of technologies and products, holds 38 patents in the door chime, security and decorative categories, and is recognized as an industry leader in the intelligent lighting and door chime markets. The Heath Zenith brand of products is sold in more than 10,000 retail outlets worldwide including home centers, hardware stores, lighting showrooms, wholesale clubs and mass merchants. HeathCo's drive to innovate, design and build quality products for its customers is the cornerstone of its success.